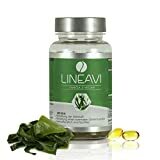 ESSENTIAL FATTY ACIDS: Made exclusively from microalgae Schizochytrium sp., LINEAVI Omega 3 Vegan provides a vegetarian and vegan friendly source of the healthy fats DHA and EPA. 250mg of DHA per serving. 60 capsules = 60 daily servings. GOOD FOR HEART, BRAIN AND EYES: DHA and EPA can help maintain healthy triglyceride levels already in normal range and support brain and eye health as well as cardiovascular system. SUSTAINABLY SOURCED, NO FISH: 100% free of ocean-borne pollutants and toxins potentially found in certain fish. Free of allergens associated with fish oil. No fishy burps of after taste. MADE IN GERMANY: GMP + HACCP + ISO 9001 compliant, state-of-the-art production facility in Germany. Every batch is laboratory tested for quality assurance. NO RISK, 60 DAY MONEY BACK GUARANTEE: It’s simple. Try LINEAVI Omega 3 Vegan for 60 days and if you are not satisfied with the performance, let us know and we’ll refund 100% of your order. The algae oil used in LINEAVI Omega 3 Vegan capsules is derived from microalgae Schizochytrium sp and is thus 100% natural and vegan-friendly. High-tech biotechnological extraction allows for docosahexaenoic acid (DHA) content of 40% (250mg of essential omega-3 fats per capsule/serving). DHA is an integral part of neural membrane phospholipids in the brain. It is also integral to the health of your eyes and has been found to help improve your immune system by supporting the effectiveness of your white blood cells, or T and B cells. One bottle of LINEAVI Omega 3 Vegan contains 60 capsules (= 60 daily servings). Take daily 1 capsule of LINEAVI Omega 3 Vegan with sufficient water.